Following on from the eventful Raw 25, the folks over at the blue brand did their best to make themselves seem relevant on the go home show ahead of the Royal Rumble ppv this Sunday. The plot between the duo of Sami Zayn and Kevin Owens against AJ Styles is growing thicker than your mum’s thighs; Randy Orton does what your dad does best and came outta nowhere; and the women of SmackDown Live show us all what putting someone over the top rope looks like. Welcome to the most must-see Vulture Hound weekly review in history; welcome to… The SmackDown Review. The episode opened with Zayn and Owens declaring they are the future of the WWE and not the legends old people we saw on Raw. Arguably, they’re all physically the present of the WWE but what do I know? AJ Styles interrupted the pair and accepted the Canadian’s challenge to face them both individually in the same night, in back-to-back matches. Daniel Bryan then appeared like a wise gnome to make the match official. Styles pointed out that Bryan may indeed be favouring the pair too much. In a later backstage segment, Shane McMahon’s animosity towards Bryan seemed to grow a little bit more as he questioned Bryan’s integrity by agreeing to the aforementioned matches. More on this later. The first match of the night saw Chad Gable defeat Jey Uso in singles competition. 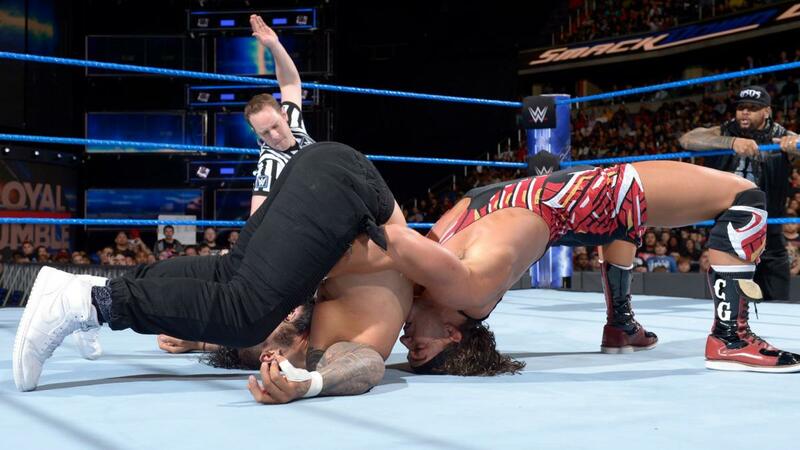 Gable pinned Jey Uso from an impressive bridging German suplex. Gable and Benjamin will take on the Usos in a 2-out-of-3-falls match for the SmackDown Tag Team Championship at Royal Rumble, probably on the pre-show. Naomi defeated Liv Morgan with a simple sunset flip. Following the match, all the SmackDown women then piled into the ring to eliminate each other as a preview to the first ever women’s Royal Rumble match. Charlotte Flair then came out to wish the winner of the upcoming women’s Royal Rumble luck for when they face her at WrestleMania. Which seemed very presumptuous from the Queen to think she will still be champion by then if you ask me. On some shaky camera phone footage, Tye Dillinger announced that he will be entering the Royal Rumble match. It remains to be seen if he will enter in at number 10 again. 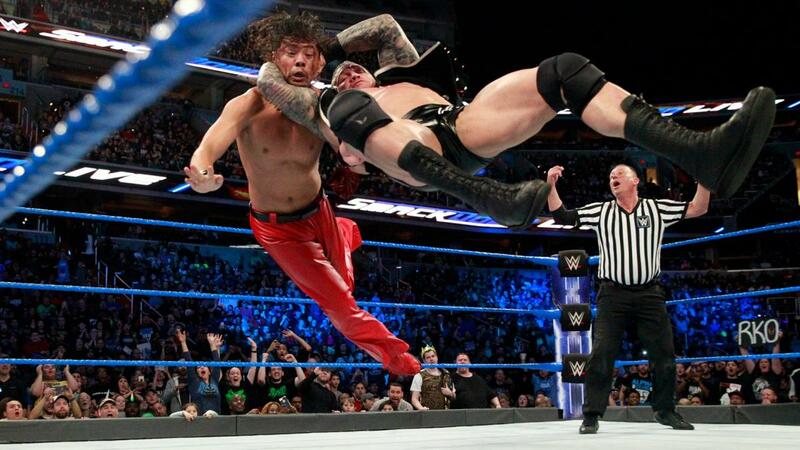 Shinsuke Nakamura won against Baron Corbin by disqualification after Randy Orton appeared “outta nowhere” and hit the artist with an RKO. After the bell, Orton then hit another RKO on Corbin for good measure. The Royal Rumble is this Sunday you know! The team of Bobby Roode, Xavier Woods and Kofi Kingston beat Jinder Mahal, Rusev and Aiden English in 6 man tag team action. Roode hit English with a spinebuster which was followed by a huge springboard elbow drop from Woods. Before the match, the New Day declared they will be entering the Rumble. I’m excited to see which crazy way Kingston will avoid elimination this year. 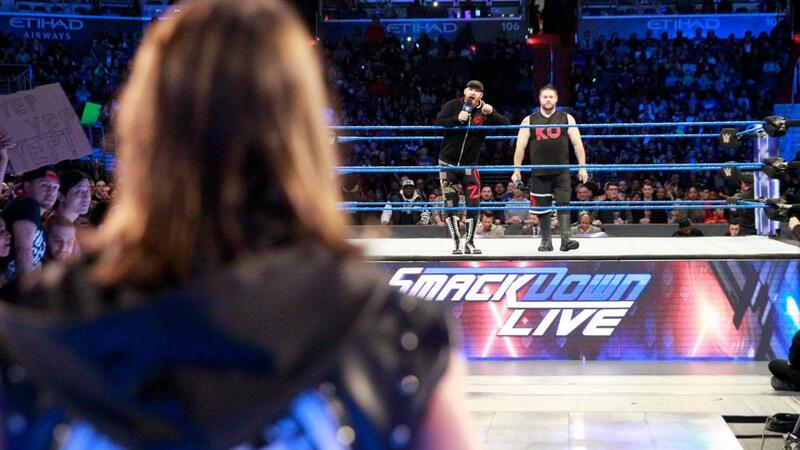 The night’s two main events saw AJ Styles take on Kevin Owens and Sami Zayn in back-to-back matches. As Owens and Zayn made their way to the ring, they were interrupted by Shane McMahon, who announced that if Zayn or Owens interfered in each other’s matches, they would be “fired on the spot”. Zayn did keep out of the match, and of course, Styles won. A Calf Crusher in about a minute was enough to see off Owens who seemed to suffer a kayfabe injury from the submission move. It is interesting to see how this story plays out as surely, if Zayn and Owen win on Sunday, they can’t coexist as joint WWE Champions for too long. I imagine whoever gets the pin will be the one who claims they are the true champion… but let’s see on Sunday!